The MilwaukeeBrewing Company brews many excellent beers; their seasonal and one-off brews are some of the best in the state. In 1997, after home brewing at his farmhouse in Cedarburg, north of Milwaukee, Jim McCabe founded the Milwaukee Ale House as a 15-barrel brewpub in the Third Ward area in downtown Milwaukee. In October of 1997, the first beer was brewed for commercial release with the Milwaukee Ale House opening its doors in November. One of his original home brew recipes, Louie’s Demise, became the flagship beer for the Milwaukee Ale House. As demand increased, the Milwaukee Ale House expanded to meet it. In 2007, Jim McCabe opened the doors of the Milwaukee Brewing Company, a 50-barrel production brew house, allowing the Milwaukee Brewing Company to bottle their beer for distribution in the Milwaukee area. In 2010, the Milwaukee Ale House became the first craft brewery in the state to can their beer, a process that requires a sizable commercial investment but becomes more cost effective and more environmentally friendly over the long term. The Milwaukee Brewing Company continues to expand, installing three new fermentation tanks, in August of 2012, taking their capacity from 6,500 to over 10,000 barrels per year. The Milwaukee Brewing Company’s current line-up consists of 6 year round offerings: Love Rock, Hop Happy, Polish Moon, Booyah, Louie’s Demise and Pull Chain; 6 seasonal beers: Sasquash, Hoptoberfest, Weekend @ Louie’s, Outboard, Black Iron and “Admiral” Stache. They currently also have a special beer called Louie’s Resurrection, a bourbon barrel aged release of Louie’s resurrection. Over at Beeradvocate, Sasquash currently has a score of 84. Oddly, it isn’t even listed on ratebeer. I can understand a beer only having a limited number of reviews, but not having it even be posted seems a little strange to me. This recipe was created by our Brewer Kurt. Along with 400 pounds of pumpkin and 300 sweet potato he used a variety of specialty malts to keep your taste buds on an adventurous ride with each sip. You’ll find the roasty flavors are well balanced with pumpkin which gives it a very smooth character. Kurt also added pumpkin spice to this Porter to give it that amazing aroma and finish. Sasquash started as a homebrew. I really wanted to create something that wasn’t like the other pumpkin beers on the market. Sasquash has a big, malty body that backs up all the spices. This year we used about 700 pounds of pumpkin and sweet potato and adding them to the wort has to be my favorite part of this brew. Along with the obvious pumpkin smells, we’ll also get the cinnamon, ginger and nutmeg aromas from the spices. We added those spices because we really wanted it to taste like a pumpkin pie. I love drinking this beer with spice cake, pumpkin pie and chocolate chip cookies. Sasquash pours a slightly hazy very dark garnet, with ruby highlights. It has a thick, foamy tan head that holds excellent retention and leaves behind considerable, intricate lacing on the glass. The aroma is complex with dark roasted malts (reminiscent of a piecrust), nutmeg, allspice, caramelized pumpkin, cinnamon, ginger and a slight nuttiness. The flavor is very close to the aroma with toasted, nutty and biscuit malts, again very reminiscent of piecrust. Bitter chocolate and honey malt notes further enhance the illusion of piecrust. To compliment the malt, Sasquash has pleasantly sweet carmelized sugars from the roasted pumpkin and sweet potatoes in addition to just the right amount of nutmeg, allspice, cinnamon and ginger. The aftertaste is well rounded and malty with plenty of nutmeg. The finish is slightly sweet. It is medium bodied with a moderate level of carbonation and a slightly creamy mouth feel. Sasquash manages to balance roasted pumpkin and spice additions in a way that not many commercial pumpkin beers can manage. It is definitely one of the best pumpkin beers that I have ever had, and that’s even considering that it was almost 5 months in the bottle by the time I enjoyed it. At 5% ABV, I am surprised that it is this full flavored after so long in the bottle. 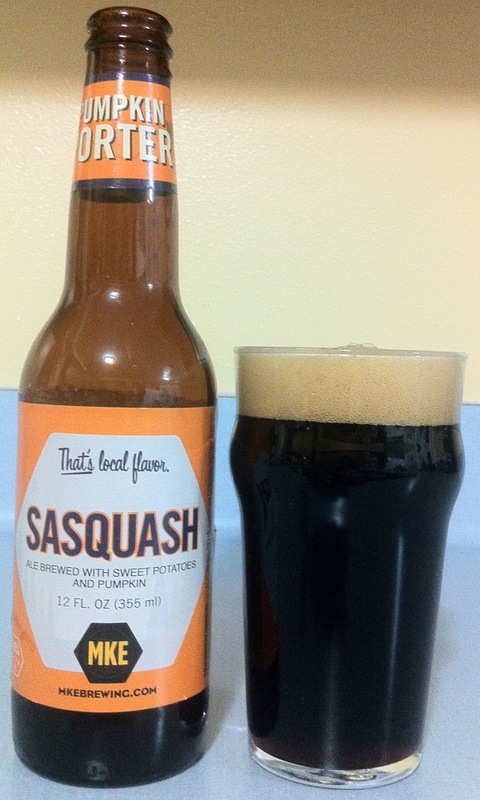 I am definitely going to be on the lookout for the 2013 release of Sasquash. With as often as I drink Milwaukee Ale House beers, I am very surprised that I haven’t posted a review of one yet. If you haven’t been to the Ale House for some food and a beer and you live within driving distance, or if you are planning on passing through Milwaukee the Milwaukee Ale House, is a must try. The Ale House also has weekly special releases of cask-conditioned ale that are sure to impress. If you have the time, stop by the Milwaukee Brewing Company, on 2nd Street in Walkers Point, for a tour of the production brewery. That is all for today, check back next week for another review! I'm a big fan of pumpkins, and a big fan of Porters, but this one didn't work for me. The bitterness of the porter overwhelmed the delicate flavor of the pumpkin. I prefer southern tiers warlock for a twist on the traditional pumpkin beer.